Bermuda’s medal count finished at a very impressive 32 after the island’s swimmers won nine more medals on the final day of the CCCAN Swimming Championships in Aruba. During the 13-14 Girls 400m Freestyle Taylor White finished 6th in a time of 4:48.81. Brian Desmond won the 13-14 Boys 400m Freestyle Gold Medal when he touched the wall in a time of 4:18.32, Jack Harvey finished in 8th place clocking 4:35.60. Skyler Powell finished 7th during the 15-17 Girls 400m Freestyle in 6th place in 4:47.25, while Vanessa Esposito finished in 4th place with a time of 4:35.34 during the Girls 18 & Over 400m Freestyle. Logan Watson-Brown won the Silver Medal during the 13-14 Girls 50m Freestyle clocking 27.24. Caleb Ingham finished in 6th place during the 13-14 Boys 50m Freestyle with a time of 25.40. Madelyn Moore won the 15-17 Girls 50m Freestyle Gold Medal when she was clocked at 25.97. Kai Legband captured the 15-17 Boys 50m Freestyle Gold Medal when he was clocked at 23.61. In the 11-12 Girls 100m Breaststroke Giada Dudley-Pun picked up the Bronze Medal with a time of 1:20.41, Josephine Duerden finished in 4th place in 1:21.13. Sam Williamson would finish 4th during the 13-14 Boy’s 100m Breaststroke in 1:11.01. During the 13-14 Girls 200m Backstroke Taylor White won the Bronze Medal in a time of 2:33.10. Logan Watson-Brown won the Silver Medal clocking 2:29.83 competing in the 13-14 Girls 200m Backstroke Final. Jack Harvey picked up the Bronze Medal competing in the 13-14 Boys 200m Backstroke in a time of 2:18.47, while Adam Young finished in 5th place in 2:19.21 and Brett Smith finished in 7th place in 2:18.68. Shannon Hassell finished 5th competing in the Girls 18 & Over 200m Backstroke in 2:34.74. 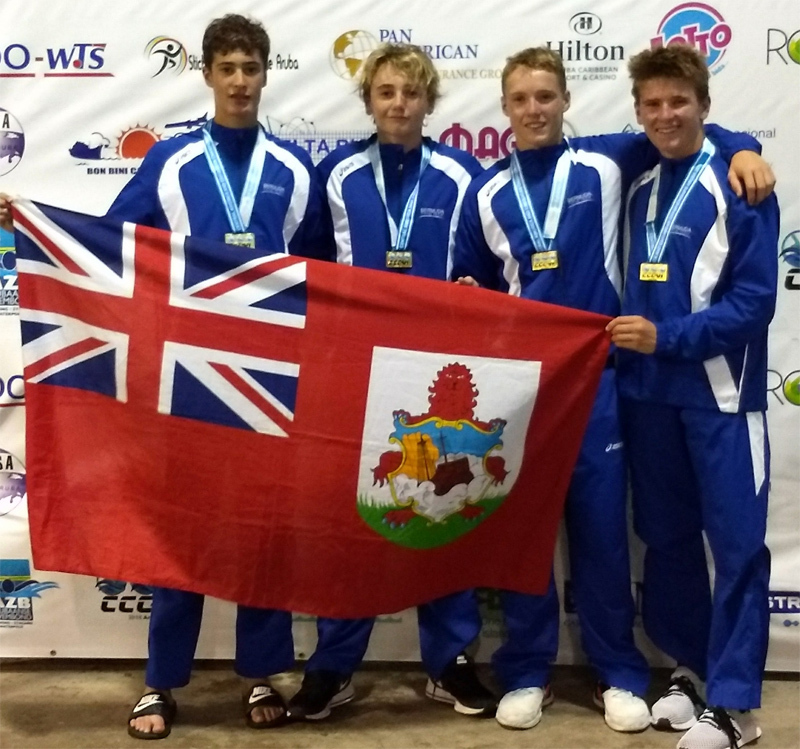 The Bermuda 13-14 Boy’s 4x100m Medley Relay team of Adam Young, Jack Harvey, Brian Desmond and Sam Williamson won the Gold Medal touching the wall in 4:13.65.